Where seen? This tree is sometimes seen in our mangroves, the bright red 'flowers' providing a splash of colour to the forest. According to Ng, it grows best on dry, well aerated soil towards the landward side but in Singapore, also found in mud. According to Hs uan Keng, it was common including at Jurong, Changi and Tuas. 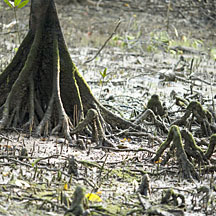 According to Tomlinson, it is a characteristic of the middle mangrove community and has been described as "the largest and probably the longest lived of the mangrove community". It has the broadest range of the genus and of all mangroves, from East Africa including Madagascar, Sri Lanka, the Malay peninsula, Micronesia and Polynesia to Ryu Kyu Islands and tropical Australia (Western Australia and Queensland). 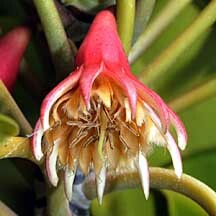 It was previously known as B. conjugata and is sometimes spelt Bruguiera gymnorhiza. Features: Tree to about 15m in Singapore, elsewhere to 30m or more. Bark dark grey or brown, rough, fissured in a regular chequered pattern with pimples (lenticels). With buttress and knee roots. Leaves eye-shaped (9-24cm long) leathery stiff glossy, sometimes reddish on the underside, arranged opposite one another. Stipules often reddish. One flower on each pendulous flower stalk, one flower per leaf angle. 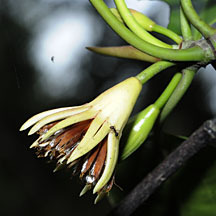 The flowers are large (2cm) with cup-shaped calyx that has 12-14 lobes. 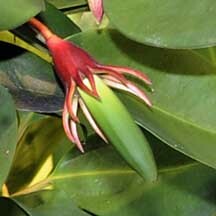 The calyx is bright red in the sun but may be pale or yellowish in the shade. Petals thin, pale orange and tipped with tassels. According to Tomlinson, the large flowers are pollinated by birds. 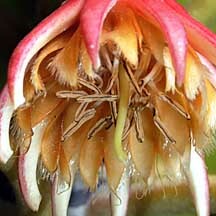 The petals of the flower form a 'pouch' that holds loose pollen and are under tension. When probed at the base, the 'pouched' petal unzips to scatter a cloud of pollen over the head of the visiting bird. Propagule develops on the parent plant: not very long hypocotyl (15-25cm long), fat and cigar-shaped, slightly angular with a blunt tip. The tips of calyx lobes bend slightly towards the hypocotyl (not bent towards the stalk). According to the NParks Flora and Fauna website, the tree is the preferred local food plant for caterpillars of the moth Olene mendosa. Human uses: According to Burkill, tannin extracted from it is used to treat fishing lines as well as a black dye. The hypocotyls are eaten, after boiling and scraping the outer skin, "but not when there is anything better available". The bark is used to flavour raw fish, but "eating too much is dangerous". Leaves are also served raw as flavouring. Medicinal uses include the bark as an astrigent in diarrhoea and sometimes to treat malaria in Cambodia. According to Giersen, in Indonesia, a sweet meat is made out of the inner hypocotyl flesh plus sugar. The red timber is hard and used for heavy duty purposes such as foundation pilings, mine timbers, house posts. As well as furniture and cabinet work. Also as firewood and for making charcoal. Erosion reveals buttess and knee roots. Buttress roots and knee roots. Large flowers, each on one stalk. 'Pouched' petals not yet open. Sepals bend towards the propagule. 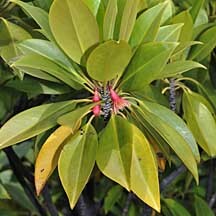 Tumu (Bruguiera gymnorrhiza) Ng, Peter K. L. & N. Sivasothi, 1999. A Guide to the Mangroves of Singapore I (Plant Diversity). Singapore Science Centre. 168 pp. 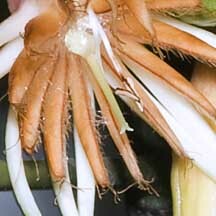 Bruguiera gymnorhiza on the Total Vascular Flora of Singapore Online: photos and fact sheet. 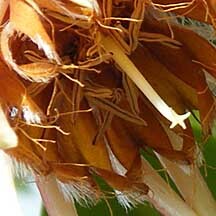 Bruguiera gymnorhiza on the NParks Flora and Fauna website: photos and fact sheet. Bruguiera gymnorhiza on the IUCN Red List: detailed fact sheet. Chiou-Rong Sheue, Jean W. H. Yong and Yuen- Po Yang. 2005. The Bruguiera (Rhizophoraceae) Species in the Mangroves of Singapore, Especially on the New Record and the Rediscovery. Taiwania, 50(4): 251-260, 2005 (pdf on the Raffles Museum of Biodiversity Research website).